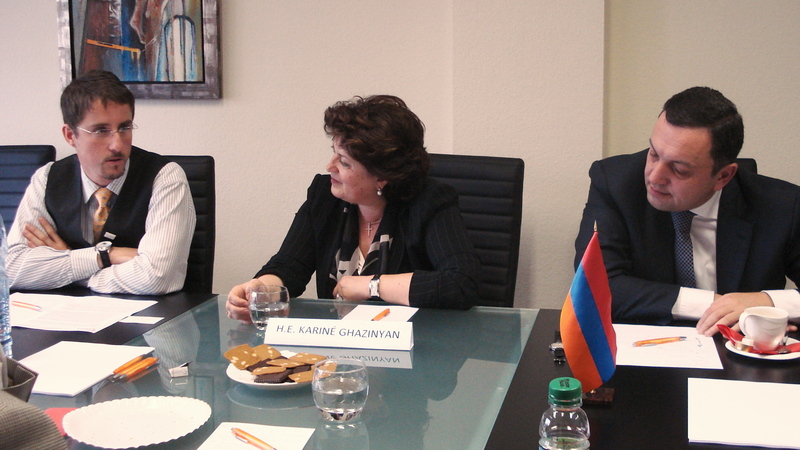 Today (6 October 2009), European Friends of Armenia held a lunchtime briefing at its Brussels office with H.E. Ms. Karine Ghazinyan, Deputy Foreign Minister of Armenia. The focus of H.E. Ms Ghazinyan’s speech and the subsequent discussion was on current key issues of EU-Armenia Cooperation and the role of the EU in Armenia-Turkey relations. The normalisation of relations between Armenia and Turkey will be a truly historic development, as it will signify the first resolution of a dispute in the South Caucasus by purely diplomatic means. The EU should fulfil the role of a guarantor for the implementation of Armenia-Turkey agreements, in order to make sure that the protocols are first ratified by both Parliaments, and then fully implemented by the parties. The Union should apply “conditioned anchoring” to both parties. By this we mean the process in which the Union grants financial, economic and political incentives to the parties involved, conditioned to further progress in the implementation of the protocols. The Union can perform this in the framework of accession talks with Turkey, and ENP/EaP conditionality when it comes to Armenia. The Union should, among other initiatives, implement Confidence Building Measures in Armenia and Turkey, promote cross-border projects and strengthen P2P contacts. The whole process is not only intergovernmental, civil societies on both sides have to be actively involved, as they are the primary stakeholders of the process. To sum up, in order to succeed in the three above mentioned challenges, the Union should begin active engagement with the parties involved as soon as possible, preferably before the signature of the protocols set to take place in Bern on October 10. Press enquiries: EuFoA is happy to provide commenting or background analysis in English, German, French, Italian, Russian and Armenian. Members of the Europe-Armenia Advisory Council may also be available for comments; for enquiries please contact our secretariat.